Please join Klamath Bird Observatory on September 23rd for our 2017 Mountain Bird Conservation Fundraiser. Celebrate a love for birds and birding and support science-driven conservation. 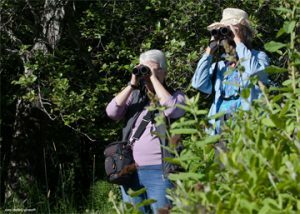 Klamath Bird Observatory’s Mountain Bird Conservation Fundraiser is an International Bird Day Event. 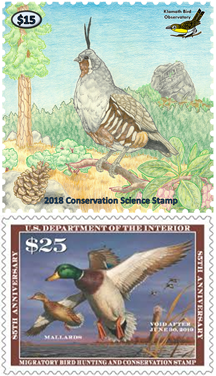 As of July of this year, Klamath Bird Observatory has become a distributor of the Federal Migratory Bird Hunting and Conservation Stamp, commonly known as the “Duck Stamp”. The Federal Duck Stamp program came into being in 1934 with the passage of the Migratory Bird Hunting Stamp Act, a legislative response to extreme population declines observed in wetland species due to the draining of wetlands for agriculture, unregulated market shooting, and periodic droughts and floods. 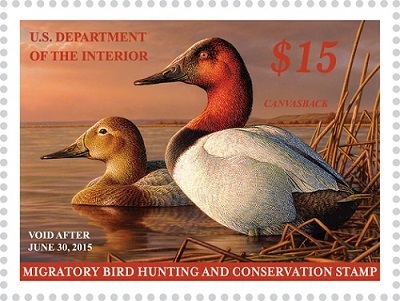 The Federal Duck Stamp program requires all waterfowl hunters age 16 and older to purchase an annual stamp, and in recent years increasing numbers of non-hunters have started purchasing annual stamps in recognition of the benefits of the program for wetland conservation. The Federal Duck Stamp program is among the most cost-effective, direct, and successful investments in conservation that anyone can make. Ninety-eight cents of every dollar raised through the sale of Federal Duck Stamps goes directly into the Migratory Bird Conservation Fund to acquire wetland and grassland habitat for the National Wildlife Refuge System. Since 1934, more than $850 million has been raised through this program to purchase or lease more than 6 million acres. Klamath Bird Observatory is proud to support this successful conservation program by becoming a Duck Stamp distributor. 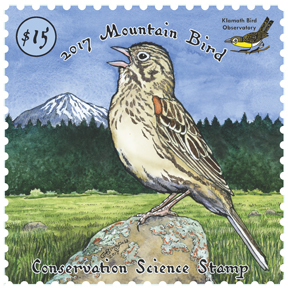 KBO’s inaugural Mountain Bird Festival, hosted in Ashland, Oregon in May 2014, became the first bird-watching event to include the purchase of a Federal Duck Stamp in the event fee. As a result, the Mountain Bird Festival sold 131 Duck Stamps, raising $1,965 for strategic wetland conservation in our nation. 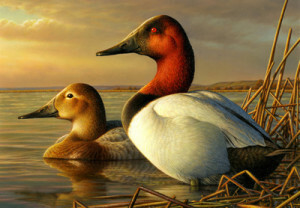 Individuals can now purchase Federal Duck Stamps at the KBO Office (320 Beach St, Ashland, Oregon) and on the KBO Website (www.klamathbird.org).